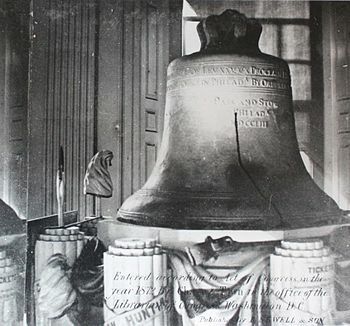 In 1751, to commemorate the 50-year anniversary of Pennsylvania’s original constitution, the Pennsylvania Provincial Assembly ordered the bell to be constructed. After being cracked during a test, and then recast twice, the bell was hung from the State House steeple in June 1753. Rung to call the Pennsylvania Assembly together and to summon people for special announcements and events, it was also rung on important occasions, such as King George III’s 1761 ascension to the British throne and, in 1765, to call the people together to discuss Parliament’s controversial Stamp Act. With the outbreak of the American Revolution in April 1775, the bell was rung to announce the battles of Lexington and Concord. Its most famous tolling, however, was on July 8, 1776, when it summoned Philadelphia citizens for the first reading of the Declaration of Independence. As the British advanced toward Philadelphia in the fall of 1777, the bell was removed from the city and hidden in Allentown to save it from being melted down by the British and used to make cannons. After the British defeat in 1781, the bell was returned to Philadelphia, which served as the nation’s capital from 1790 to 1800. In addition to marking important events, the bell tolled annually to celebrate George Washington’s birthday on February 22 and the Fourth of July. The name “Liberty Bell” was first coined in an 1839 poem in an abolitionist pamphlet. The question of when the Liberty Bell acquired its famous fracture has been the subject of a good deal of historical debate. In the most commonly accepted account, the bell suffered a major break while tolling for the funeral of the chief justice of the United States, John Marshall, in 1835, and in 1846 the crack expanded to its present size while in use to mark Washington’s birthday. After that date, it was regarded as unsuitable for ringing, but it was still ceremoniously tapped on occasion to commemorate important events. On June 6, 1944, when Allied forces invaded France, the sound of the bell’s dulled ring was broadcast by radio across the United States. In 1976, the Liberty Bell was moved to a new pavilion about 100 yards from Independence Hall in preparation for America’s bicentennial celebrations. It remains there today and is visited by more than 1 million people each year.